This first one is by Los Pimpollos – a Peruvian children’s show. They’re cute- puppets, similar to Plaza Sésamo. 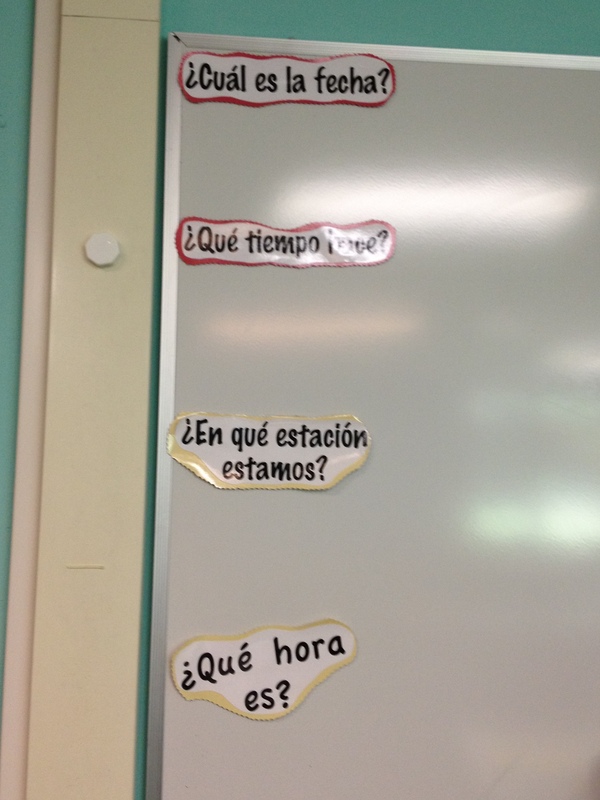 Here is the cloze activity for Las Cuatro Estaciones. This one is by Coca- Cola – It’s the song Tomorrow, but in Spanish. Here are a few videos I found from Despierta América’s weather segment. These are a little fast – but read this post from the Musicuentos blog to learn why it is SO, SO important to expose our novice learners to authentic audio- they’ll thank you (and their teachers too!) in a few years when they’re in the higher levels. How would you use these authentic audio clips with novice students??? Routines are so important- at every grade! I start every lesson- from day one with a routine- this helps the students not only pick up on so much target language but they know what to expect, it provides structure and it saves valuable class time. From day one I explain to my students that when they come into class they are to complete the “calentamiento” or daily warm-up, this is projected onto my smart board and is either a speaking or writing activity or sometimes it involves turning in an assignment or setting up a project- but they always have something to do. This gives me time to go around and check homework, take attendance and check in with students. The students have a Spanish binder with a calentamiento section and this is where they keep their work- I usually have them keep them for a few weeks so they can look back for reference and review. This year I am giving my students calentamiento sheets so that they all have the same structure for setting up their papers- here is the word doc. I had a lot of trouble copying and putting more than one on a document so when I made copies I just cut and paste old school style! Once I see the students are done with the calentamiento (5-10 minutes or so) I greet the class. My greeting includes a welcome, good morning/afternoon, I ask the date, the weather and the time. Within a few short weeks the students are experts at answering all of these questions and by then I begin to have a student of the day and s/he asks the questions and calls on students to respond. Here is a picture of the board I use to write the answers. 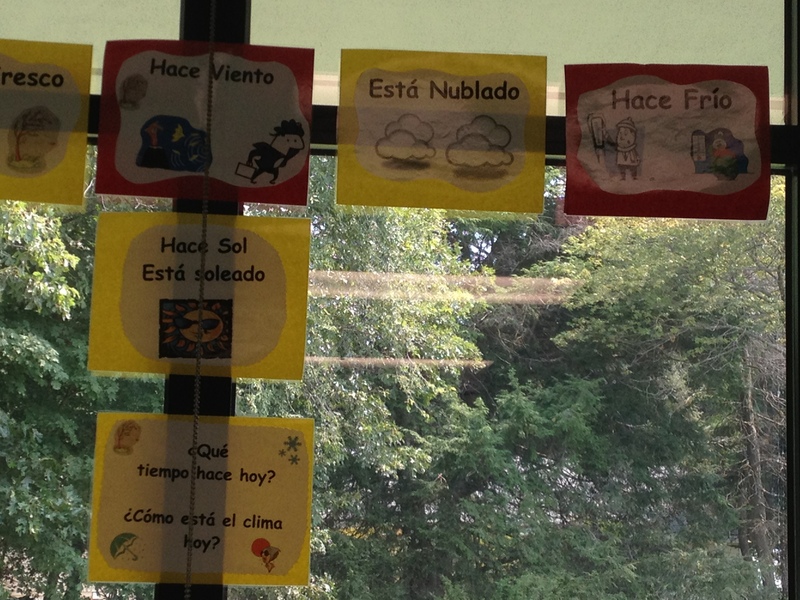 There are always visuals to help- the questions are up, they can see the calendar, days of the week/months and weather expressions. Part of this routine also includes a word/phrase of the week. This is a tradition that I began last year. At first I started with a word of the day but I felt that the students were not learning these words or using them enough in context. The Creative Language Blog inspired me to change my word of the day to the word of the week. I started doing this and the students vocabulary exploded! They were using the words all the time- orally and in writing. The incentive of course helped- I give them a billete (a copy of a bill from a S.S. country) when they use the word in context and they write their name on it and put it in a bucket. At the end of the week I pick 3 names and they all receive a small prize. I bought plantain chips, made CD’s with Spanish music and also gave free homework passes. I will continue this tradition this year and I will start a document I will share with everyone with the phrases I use. I also went out to Target to look for prizes and found some super cheap pocket dictionaries that I will use for prizes as well.